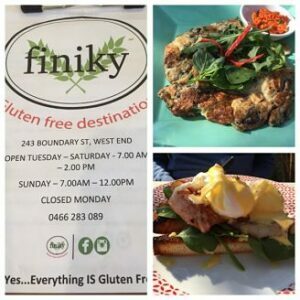 Finiky is a 100% gluten free cafe in a inner city suburb of Brisbane called West End. This area is on the other side of the river to the CBD and is walkable on a nice day (around 35 minutes from the Botanical Gardens). 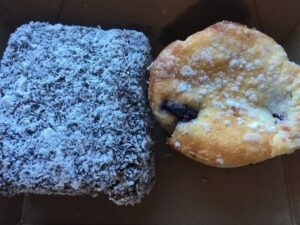 As well as being gluten free, they also want people with other allergies (especially to dairy, soy, sulphites, yeast, preservatives and additives) to be able to eat safely. The owner herself has a number of allergies, so understands the frustrations of eating out on a restricted diet and also wanting a cake related treat sometimes! 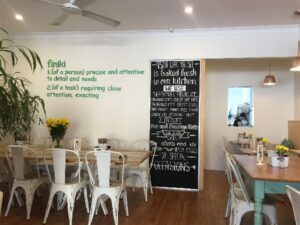 Finiky is open early to cater for the breakfast trade and close at 2pm after the lunch trade. There are a number of delicious options on the menu, including a small kids section. The menu changes seasonally and you can have a look online before you go to see what temptations are on offer. 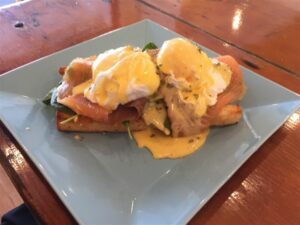 There are traditional breakfast options such as eggs and bacon, as well as some things with a twist, such as wild fig and macadamia toast instead of just plain toast. 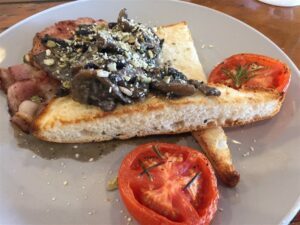 It was hard to resist the pancakes on the menu, but the dukkah mushrooms were a great choice and were beautifully flavoured with parmesan and garlic, served on Turkish bread with bacon and tomato. My (non gluten free) lunch buddies also enjoyed their meals, noting that the serving size was just right. 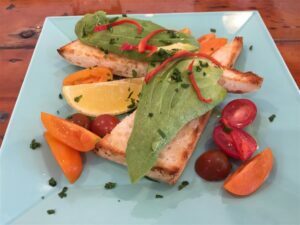 How pretty does the avocado on toast look? We enjoyed it so much we went back there the next day too and two of us opted for the Thai omelette (shown in the collage above) with a lemongrass and chilli sambal which give it a nice ‘kick’. There is also selection of savouries in the front counter cabinet, including bagels, salads, pasties and sausage rolls. These aren’t listed on the menu but you can eat these in house or take away if you don’t have time to stop. If you just want coffee and cake, you will find it hard to choose from a wide variety of home made cakes and slices. 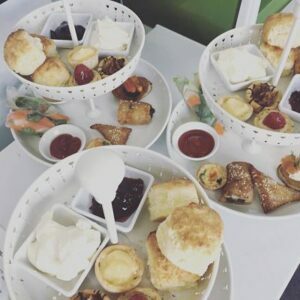 You can also pre-book for high tea on a Saturday which looks like a lovely way to while away some time on the weekend. Finiky are also available for catering and cakes which is great for locals having a party. 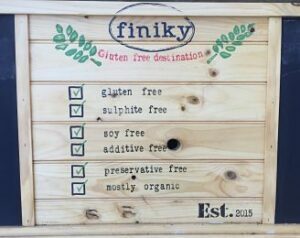 I really enjoyed my visits to Finiky and would definitely recommend you make the effort to get there for gluten free Brisbane treats, whether you are a tourist or a local! It is not far from the CBD and if you don’t have a car, you can easily get a bus, take a short taxi trip or a leisurely stroll in the warm Brisbane weather. If you have a dog with you or just want to sit outside, they also have a garden at the back of the cafe.